The fork of ethminer from Genoil that is specifically optimized for Nvidia CUDA GPUs has been updated to a new beta version – Ethminer 0.9.41-genoil-1.0.6 (source). 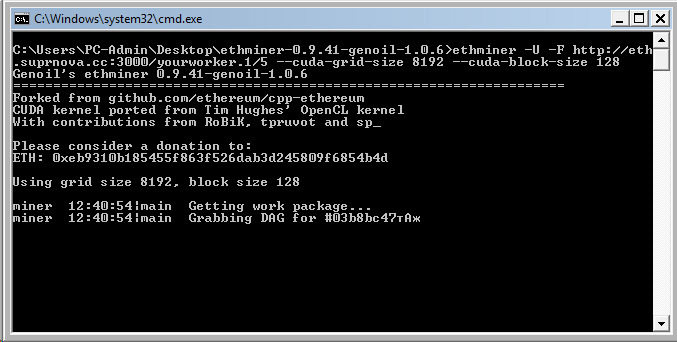 The latest release of Genoil’s ethminer for CUDA comes with some fixes and new useful features, so if you are using it you might be interested in checking the new 1.0.6 beta, but be aware it can have some bugs. The latest version by default should run on all available CUDA GPUs like it does for OpenCL, it has an option to delete old DAG files that are just taking up space, comes with Stratum support and an option to set a failover pool in case the main one fails for some reason. You can check the help.txt file for the new options available in the latest release and yo are welcome to try them and report if everything works Ok for you. The fork from Genoil, although targeted at Nvidia CUDA miners, will also work on AMD OpenCL GPUs, but there it should not be any different than from the default ethminer that is OpenCL only.